It has been a while since I have picked a vegetable to talk about. But today I am craving beets, and since I can't eat a beet right now, I am going to do the next best thing.. Talk about them! I think much like the Brussels Sprout I love so much, the beet has gotten a bad wrap. This is due mostly in part to people growing up only ever trying a beet from a can. Those red discs that taste exactly like the can they plopped out of. Those are nasty!!! And they have kept the beet from getting the love they deserve! 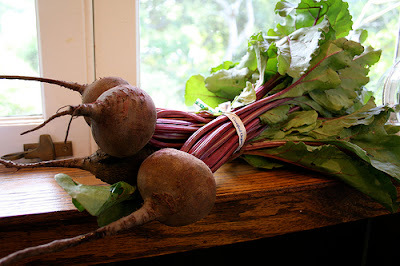 In recent years, the beet has gained more popularity as more chefs started serving them more regularly. I think this is in part to the general public having more interest in where there food is coming from and how it is prepared. Smarted clients = better product. I think what I was most surprised to learn when I Googled "Beets" is that Char is in the beet family. As in Swiss Char. I love that stuff!! I am not exactly sure how long it has been, but I am guessing it has been about 2 years since the Cub Room closed it's doors in Soho for good. Since then I am sure I can't be the only one who's missed it. However, I am sure that I am not the only one that was excited to see what was coming next. The restaurant space is big and cozy at the same time. Someone with the right idea could really do something amazing with this space. After years of seeing the location closed up with brown paper covering the windows, it was great to hear that the people from Locanda Verde were moving in!! This new spot will be called The Dutch. With little effort it was clear that people were excited. It took 3 seconds on Google to find a ton of info on this upcoming venture by Andrew Carmellini who we all love because of how amazballs Locanda Verde is.